Aristocrat are one of the biggest developers of casino pokies, and with their Stormin’ Jackpots range, made up of Indigo Cove, Lotus Garden, Island 777, and Bushido 7, they have released games that all have varied themes and styles, but share2 progressive jackpots. Housed in the Viridion Hybrid cabinet at numerous casinos, the Stormin’ Jackpots games are each laid out in a classic 5-reel format, although the number of paylinesand the number of rows of symbols varies, with Island 777 for example, having just 25 lines, while Lotus Garden does away with lines altogether and has wins created by landing 3 or more symbols on adjacent reels in any of 243 different ways. One other thing they have in common is the small set of 5 reels tucked away in the top right corner of each game, where the only symbol is a cloud with a lightning bolt coming from the bottom of it. These small reels spin each time the main ones do, with either the cloud symbol showing, or nothing at all, and players enter the jackpot round any time all of this set of reels come to a stop with the cloud in view. It’s not over yet though, as there’s another step to take before anyone is walking away with a jackpot prize, as they will first see a weather map of the USA, overlaid with 15 reels positions that spin horizontally, stopping to reveal bonus wins or the Stormin’ Jackpots symbol that will stay fixed in place. Players have a set number of spins to land as many jackpot symbols as possible, with a total of 12, 13 or 14 being enough to win the Minor progressive prize, and if all 15 positions end up with the logo symbol on them, players win the Major jackpot. There’s a little counter to one side of the map that fills up as the logos are collected, but it seems a bit superfluous, as it’s pretty obvious which of the 15 positions have landed one already. 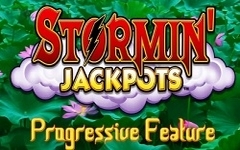 Each of the 4 titles comes with a unique theme as well as extra features that supplement the Stormin’ Jackpots and ensures that even if the progressive round isn’t triggered, there’s still plenty to keep players engaged. Lotus Garden is another example of an Oriental-themed pokie from Aristocrat, who seem to love this type of game.It’s covered with images of flowers, along with the classic pictures of ornamental fish, and a cute panda bear. If the Ying and Yang scatter symbol appears in at least 3 spots at once, players are taken to a free spins game where all winnings are doubled throughout. If the lantern feature is triggered during the free spins, players get to pick from 5 lanterns for instant bonus prizes or more free games. Island 777 takes place in a tropical paradise and has colourful symbols to go along with it, as well as the traditional Bar and ‘7’ icons that have been used in countless pokies for many years. When the free spins round is triggered, players will need to select a flamingo from the 5 lined up before them, getting either extra wild reels or wild multipliers that will be in effect during the bonus games. Indigo Cove is a Caribbean-set pokie where players get to choose from 3 different free games formats. They can pick 15 free spins with bonus symbols in the Emerald Reef round, go for just 6 free spins, but with all wins multiplied 5x in the Lost Shipwreck game, or enter the Hidden Cove, where they will see all wins doubled in value throughout the 15 free spins. The Japanese-inspired Bushido 7 sees the blade of a samurai sword slicing through the reels to award 2 bonus games, with a free spins round that has random additional wild symbols in place and a separate wild bonus where animated fighters combat each other and leave behind extra wilds in their wake. The Stormin’ Jackpots range can be configured by the casinos as stand-alone progressive machines, or simple non-progressives, where the jackpots are a set amount. Whichever format is in use, players won’t be winning massive amounts on these games, but certainly not insignificant prizes either. The base games are each of a high standard anyway, covering themes that may not be particularly original, but are proven to be popular. It’s nice to see that each has a different bonus round, as quite often pokies with linked jackpots are virtually identical, so anyone looking for a bit of variety could find that the Stormin’ Jackpots range are just what they were hoping to find on the casino floor.